Our proud tradition at Marek is born of the fact that three Czech brothers from South Texas overcame the economic storm of The Depression in the 1930’s by mastering the art of drywall. Since that time, we've branched out in ways that folks in 1938 could probably never have imagined. Sure, we still hang a lot of drywall and our industry recognizes the fact that Marek takes on some of the biggest and most complicated jobs, but I think the story that rarely gets told has to do with the wide variety of services we provide to our customers on a daily basis. Marek is able to maximize efficiency on the projects we tackle through the use of Building Information Modeling, or BIM. In the video, you’ll see what I mean. 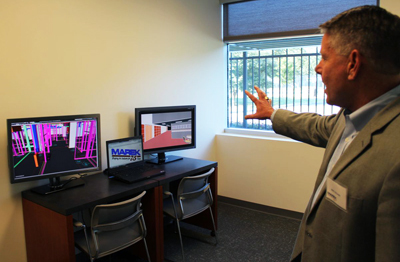 It’s a good example of not only being able to show what kind of information technology is used to control costs and resolve issues, but you can look around the rooms that were actually built using that technology and really see the finished product. All of the finishes seen in the video are services we provide for our customers. We’re now able to provide a majority of the finished products within every office and space that we build – everything from the metal studs/drywall to the ceiling grid/tile, the floor and the wall finishes. Those products include Mechoshades, Novawall, and something called Newmat. In the video, you’ll see wood ceilings – a product of Armstrong – and the Newmat, which is a stretched PVC product with recessed lighting above. It makes for a really cool effect in any lobby, conference, or public space. Even though your mama told you not to write on the walls, we know that people in just about every office in America do that now when presentations are made involving whiteboards. 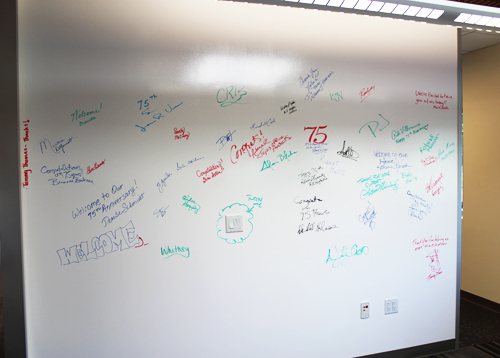 We’ve taken it a step further by actually providing a wall surface you can write on and then erase. It looks like the whiteboards you’re used to, but it’s a paint product that that makes the entire wall a surface on which you can make a presentation. Please take the time to check out the rest of our website for more on the variety of services we provide.